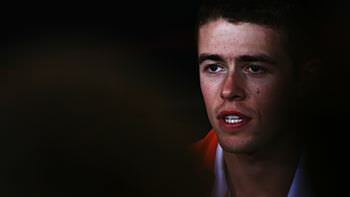 Paul di Resta has this week been confirmed at Force India for next year, gaining a second season with the team after a strong and consistent performance during his rookie year in 2011. As a dedicated Paul di Resta fan, Steven Roy had faith in his driver from the start, and provided us with a one word summary of each race weekend this season. Now that the year is drawing to a close, a compilation of the words shows us just why Force India have chosen to re-sign the young Scot. Some ups and downs, as you would expect in any season and particularly that of a rookie. Overall though, you'd have to say that Di Resta has impressed with his confident approach. Many times his interviews come across as though he has years of experience in the F1 paddock, and it's clear that he's always putting in a lot of hard work to try and do his best. I hope that Force India can move up the field a little in this next season - not so much for the team, but for their new driver pairing. Hülkenberg has been patiently waiting for an opportunity, and Di Resta has proved that he deserves the chance to start winning.